This calligraphy, by our Japanese swordsmanship teacher, Katsuse sensei, was written for our Anaheim school. It hangs in our training hall. The main wording from right to left reads as "Without the heart (or spirit), there is nothing else." In Japanese romanji, it reads as "Shin gai mu beppo." In any activity, the presence of our heart or spirit in our work makes all the difference. It is especially so to me as a sculptor. As artists, we leave a part of us in the works we create. We may not consciously know it, but, in creating something out of nothing and seeing it to completion, we impart our energies in our handiwork. In my martial arts training, it reminds us what we are striving for; to train totally with our body and spirit, and not merely going through the motions. What I am learning from my master's teachings can be aptly put to practice in my ceramic works. "Without the heart, there is nothing else." My new set of 3 Japanese themed demon masks. This was how they turned out after today's raku firing, Cone 06. I used a clear crackle glaze on all three pieces. Some areas have more crackling than others. The darkening around the eyes make them look even scarier. I decided not to clean them up too much. They should scare away evil spirits, maybe, even unwanted solicitors from your house. I don't think I want to meet any of them in a dark alley! 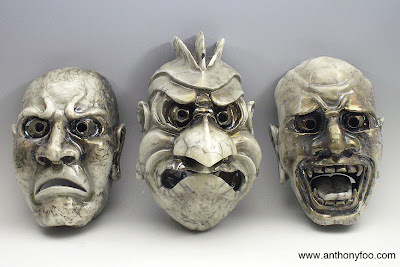 I came across the paper clay version of this clay several years ago at the Laguna Clay Company in Los Angeles. Since then, they have stopped carrying this imported clay which hails from Australia. The USA distributor for this Southern Ice Porcelain clay is Seattle Pottery Supply in Seattle, Washington. Their website is www.SeattlePotterySupply.com. They don't carry the paper clay version of this clay and have no plans to import it here to the US. 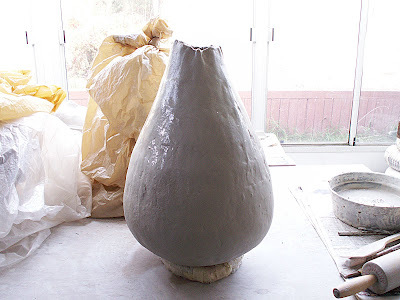 You already know how to make paper clay from a regular clay body from my earlier posts in this blog. S0, you are set! One of the things I tell my new paper clay students is that what you learn about this clay just adds to what you already know about ceramics and clay. It is not an either or situation. Your past experiences with a traditional clay can be transferred to paper clay. You just have to know what situation calls for the best technique. Paper clay and its techniques can be a new and invaluable new tool in your "ceramic toolbox." Use what you know to achieve the result you are looking for. As you can see in this picture, my works in progress are covered with plastic. I have several projects going on at the same time and it's easier for me to continue work on the paper clay while it's still in the wet or leather hard stage. I hand build all my sculptures, including the ones that may look like they have been done on the wheel. There is just something missing when I do any wheel work. The preliminary stage of this piece I'm working on could have been done on the wheel. I was thinking about this as I was building up the sides. There is just something that I enjoy when I hand build, something moves within me, something reverent; paying homage to this lowly material that has taken millions of years to form and now I'm touching, feeling it. Whenever I pinch out a ball of clay, I figured early potters must have done pretty much the same thing. How incredible it is that the basic material and technique have not changed in tens of thousands of years. Our two hands, our ten fingers and a lump of clay becoming fantastic creations, limited only by our imaginations. The sun is good for you. 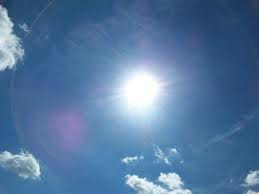 Our bodies need the sun to make Vitamin D which is essential to our health. All clays can use the sun's solar power to firm up, but with paper clay, you don't have to worry about the clay going past leather hard. In fact, even if the paper clay is way, way dry for conventional (traditional) joining, it is not an issue. Paper clay with bond with itself with the correct joining techniques. With a traditional clay, once you go past this "leather hard joining window," you run into risk of your joints coming apart or the joints not even taking hold. There are so many times I've said to myself, "Thank goodness I'm using paper clay for this project." Using the sun's benefit is part of "forced drying". Here's the link to an earlier post of mine about this subject. This is my new teapot project after completing all the dippings in paper clay slip. 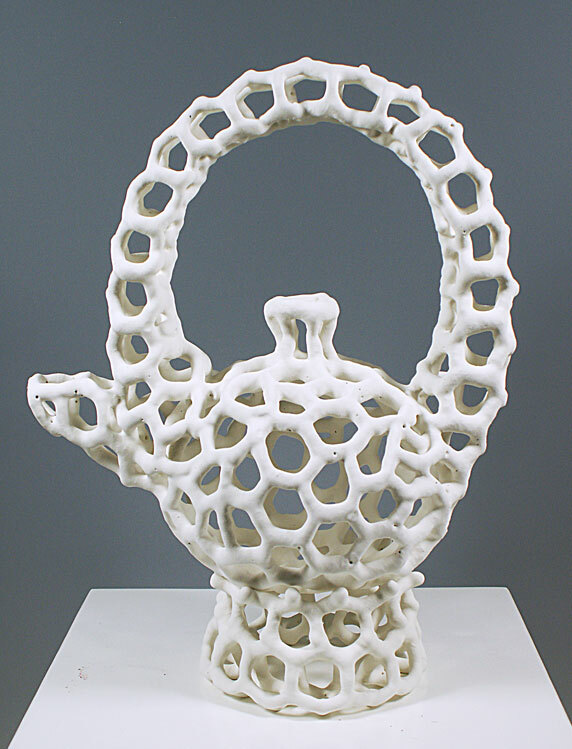 The teapot and the base are separate pieces. 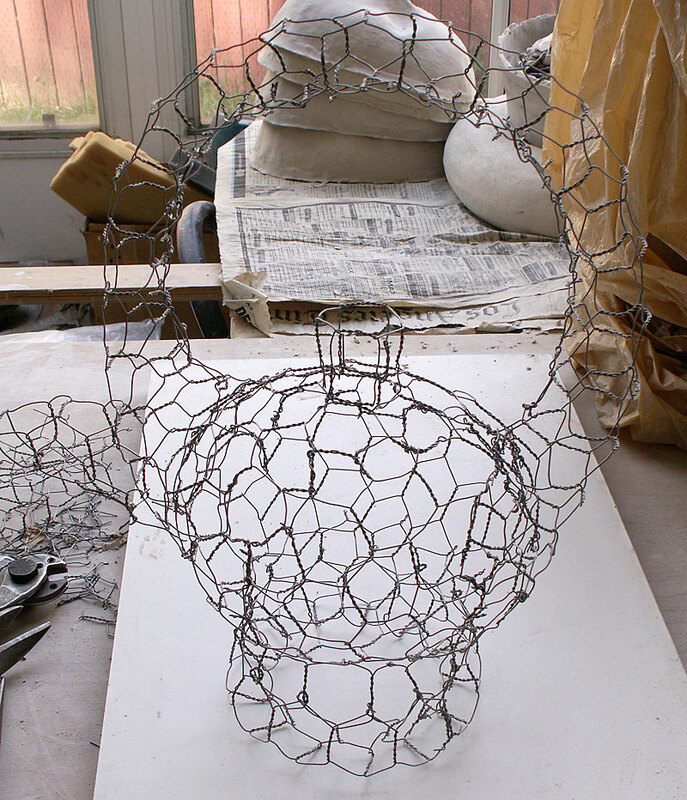 I decide to build the base for the teapot to sit on and to elevate it off the ground. It took me 19 dips over a span of 8 days in the Gault 1o paper clay slip and about the same number of dips over 4 days in the Southern Ice Porcelain paper clay slip (thin consistency) to achieve this. I used the Southern Ice porcelain paper clay slip for the final coats because I really like the brilliant whiteness of the porcelain paper clay when it is bisqued fired to Cone 04. One of the properties of paper clay is that you can add wet paper clay (in the case, slip) to a bone dry piece with no problems at all. The piece is bone dry and ready for bisque fire. It's a sculptural piece, a take from my earlier work titled "Empty Calories"
This steel mesh form has been dipped 5 times with paper clay slip. The paper clay I am using is the Gault 10 Pclay from Aardvark. 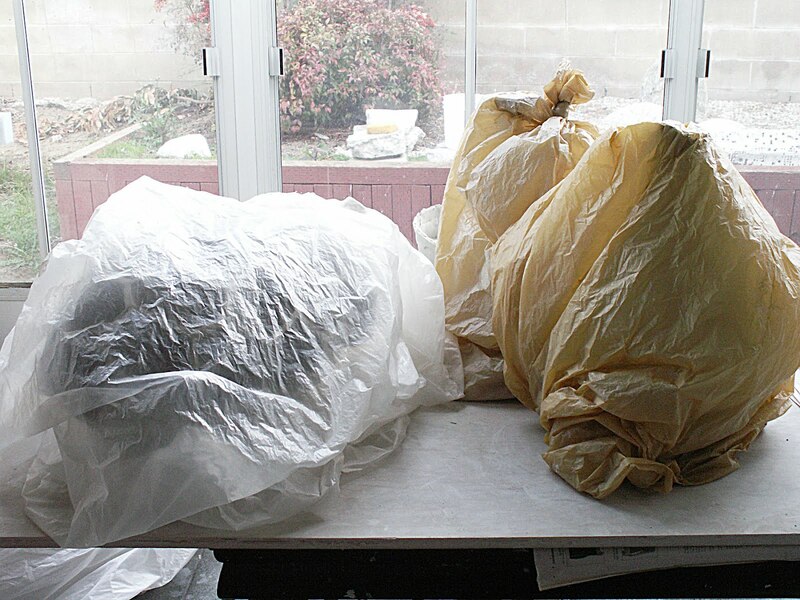 It's my standard paper clay for my sculptural works. The first time the piece is dipped in the paper clay slip only a very light coating stays on the wire. With successive dippings, the layers build up and it depends on how thick you want the final form to be. Right now, it is still in the formative stage. It will require many more dippings and dryings in between to build up to the final stage. Summer time (or a very mild winter like what we are experiencing here in So. California right now) is always a great time to do this kind of project as the paper clay slip dries quite fast. On an average day, I can manage 2-3 dippings. Recently, I've been fascinated by creating complex 3D wire forms from the lowly "chicken-wire" that one can get at a hardware supply store. 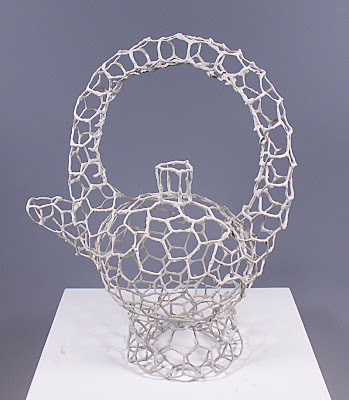 Quite interesting wire sculptures can be formed from this flexible medium. I've used both hexagonal mesh and a square mesh. The hexagonal mesh lends itself to more organic forms. The square mesh is great for geometric and straight sides pieces. 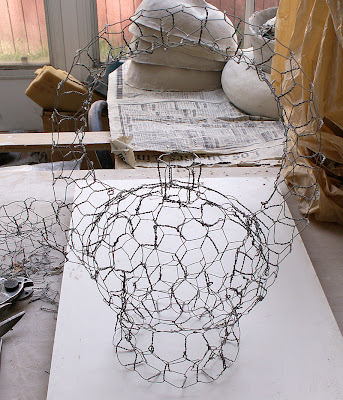 I enjoy making the wire sculptures as it takes me out of my clay environment and puts me in a different mind set. With simple tools like a wire cutter and pliers, one can fabricate forms limited only by ones imagination. One word of caution though; your fingers can get really torn up by the wire even though I use the pliers as much as I can. Sometimes, it's just a lot faster to bend the wire by hand and if you are not careful ... ouch! When my fingers hurt, I take a break from the wire-forming, give my hands and brain a rest and come back to it later on with a refreshed enthusiasm. This project is a spherical tea pot with a base. Wrapping a piece of steel mesh into a sphere is quite a challenge and I wanted to see how difficult this would be. 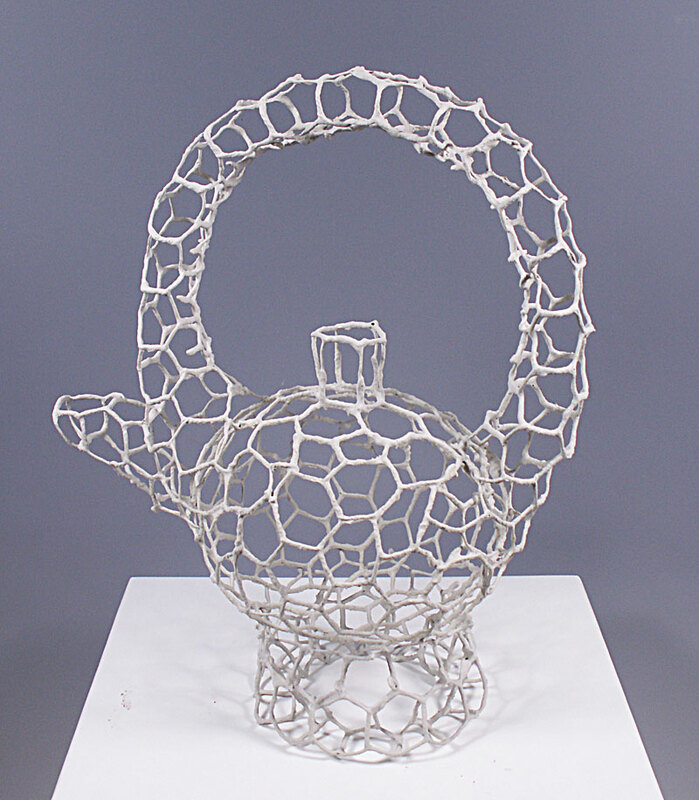 The teapot body is made from one sheet of the mesh while the other parts were made from the left overs. I decided to make a base for the teapot to sit on.